Marketplace integration to sell better is no longer optional for online as well as offline sellers. With more and more customers opting to buy online, it is a matter of survival. Getting listed to be listed on the marketplaces to get higher traffic and conversions for your products. Without a visible online presence it can take years before your products witness the level of conversions needed to make your online store a success. We have already discussed in our previous blog how listing on marketplaces like Amazon, eBay , Flipkart etc gives your products greater visibility and better sales. However, selling on multiple marketplaces might become a bit chaotic if you do not have a marketplace software that simplifies the integration and order management process for you. Just imagine how cumbersome it would become if you go different dashboards to manage your products, inventory, shipping etc for each marketplace. Remembering all your daily transactions and comparing them would be difficult, time taking and confusing. Whether you sell on Flipkart, Amazon or any other marketplace you can see your complete order history in a single view using StoreHippo integration tool. The details of your order along with order quantity and product variant will be completely available for you to manage within the dashboard. You can also generate the invoice number and other details from your dashboard for all the marketplaces. 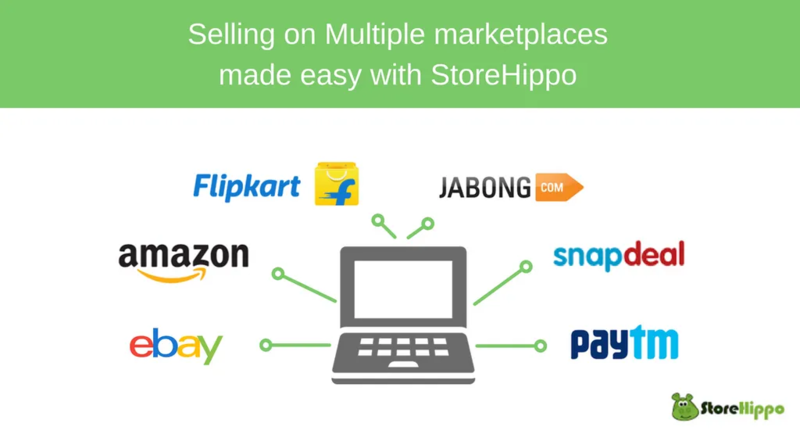 Managing inventory across marketplaces becomes super easy using StoreHippo integration for marketplaces. Whether your product is sold on one marketplace or on multiple marketplaces, the inventory gets automatically updated for each sale. StoreHippo also offers out of stock option which will show your products out of stock if the inventory is completely exhausted. Using StoreHippo marketplace integration you can see your complete financial details including commissions and payouts in the seller ledger. You can also sort out various payments month wise or on yearly basis using the various filters provided along with the feature. The feature is very easy and transparent and gives you a complete view of your performance on various marketplaces. StoreHippo is also a logistics aggregator and provides you logistics services of some of the world’s best logistics providers. You need not pay upfront to any of these and you get discounted rates for your shipping packages. Using StoreHippo tools you can also generate mass shipping labels, break up the orders for different shippers to ensure faster delivery and generate invoice for split orders as well as multiple orders clubbed together. Marketplace software also allows to track customer behaviour across various marketplaces. This helps you plan your business according to different customer segments and get maximum ROI from your efforts. Based on user preferences you can give discounts on certain products that are not selling well or combine it with bestsellers and popular products to upsell and clear your inventory. There are many options that can be tried based on the insights you get from the data in your dashboard. Marketplace software frees your time to from the headache of managing the nitty gritty of your business and allows you to focus on selling rather than managing. By taking care of inventory management, order management, shipping management , seller ledger and providing your with comprehensive data for analysing your business the integration takes away all the hassle of managing your business. So, plan your business for maximum profit and start selling. Now that you know the various benefits of the software that allows your to sell on Flipkart, Amazon and other marketplaces what are you waiting for. Open your 14 day free trial store with StoreHippo and explore the benefits. If you have any queries about integrating your store with marketplace you can leave us a comment below. MISLEADING blog. Indicates free trial store with no indication of charges, after trial period.